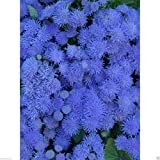 Ageratum conyzoides growing herbaceous of the genus Ageratum also known as Whiteweed, Ageratum conyzoides annual plant, also used as ornamental plant and as cut flower and attract pollinators, can grow in mediterranean, desert, subtropical, temperate or tropic climate and growing in hardiness zone 3+. 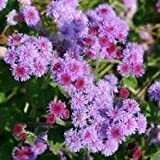 Flower color can be: purple (light to dark) or white, flowers petals small like needle and create shape of pompom. 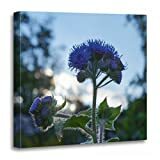 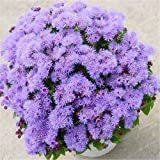 TORASS Canvas Wall Art Print Purple Sunset Ageratum Floss Flower Blue Pretty Artwork for Home Decor 20" x 20"